I'm very excited to write this blog post--almost as excited as I was to make this soup! And use my new kitchen electronic appliance! An immersion hand blender!! Yay! This handy dandy tool is a little blender on a stick. I can use it to puree soups, "whip" up all sorts of delicate things, smoothie up some fruits, and whatever else I want! This was my birthday present to myself. The first thing down was Cream of Tomato Soup from The New Best Recipe cookbook. The tomato roasting before the soup building began was a bit of a process but well worth it. This soup is delicious!! 1 1/2 tbsp dark brown sugar I only had light in the pantry! 1. Adjust an oven rack to the upper-middle position and heat the oven to 450 degrees. Line a rimmed baking sheet with foil. Seed the tomatoes and spread in a single layer on the foil. Sprinkle evenly with brown sugar. Bake until all the liquid has evaporated and the tomatoes begin to color, about 30 minutes. Let the tomatoes cool slightly, then peel them off the foil; transfer to a small bowl and set aside. Tomatoes ready for the oven. 2. Heat the butter in a large saucepan over medium heat until foaming. Add the shallots, tomato paste, and allspice. Reduce the heat to low, cover, and cook, stirring occasionally, until the shallots are softened, 7 to 10 minutes. Add the flour and cook, stirring constantly, until thoroughly combined, about 30 seconds. Whisking constantly, gradually add the chicken broth; stir in the reserved tomato juice and the roasted tomatoes. Cover, increase the heat to medium, and bring to a boil. Reduce the heat to low and simmer, stirring occasionally, to blend the flavors, about 10 minutes. After adding roasted tomatoes to the soup base; ready for boiling. 3. Strain the mixture into a medium bowl; rinse out the saucepan. Transfer the tomatoes and solids in the strainer to a blender; add 1 cup of the strained liquid and puree until smooth. Combine the pureed mixture and remaining strained liquid in the saucepan. **Or use your cool new immersion hand blender. ** Add the cream and warm over low heat until hot, about 3 minutes. Off the heat, stir in the brandy and season with salt and pepper to taste. Serve immediately. I gave Patrick the honor of playing with the new toy first! It's great! Served with grilled cheese croutons and in the gorgeous Occupied Japan china Granny and Poppa gave me for Christmas. We were having a little date night in. **note: soup is more than just a comfort food! As many of you know I just turned 24!! I was born 24 years ago here in Chapel Hill during an awful ice storm. It was so nice to celebrate 24 years later with highs in the 70s! I celebrated with friends and family all throughout the week. Granny and Poppa came to take me out for a wonderful lunch at Alivia's in downtown Durham with Rachel and Patrick. Mom and Jimmy came up after my birthday and took me out for Sunday brunch at 411 West on Franklin Street. Then I had lots of fun celebrations with great friends throughout the week including a raucous night of bowling. Now time for some hide and seek on the blog!! These next two photos feature my two new KitchenAid appliances: an immersion blender and an electric stand mixer (my absolutely fabulous birthday present from Patrick; I was selfish and the immersion blender is to me, from me). These photos are in upcoming blog posts. Have fun spotting them! Even though this is mainly a cooking blog it's still personal! Here are a few photos from bowling. Maybe someone got a strike?! Heat waffle iron. Whisk dry ingredients together in medium bowl. Whisk egg yolk with buttermilk and melted butter. Beat the egg white until it just holds a 2-inch peak. Add liquid ingredients to dry ingredients in thin, steady stream while mixing gently with a rubber spatula. Toward the end of mixing, use a folding motion to incorporate ingredients. Gently fold egg white into batter. Cook appropriate amount of batter in waffle iron until golden brown. This recipe is from my Better Homes & Garden Big Book of 30-Minute Dinners cookbook. I probably don't utilize this cookbook enough because all the recipes are accessible and look delicious. This might be one of the first cookbooks I actually purchased. I bought it sophomore or junior year at the clearance Barnes & Noble section and look where we are now. Even though the recipe is pretty simple (seared steak with the wine-mushroom reduction sauce) the cookbook provided me with an idea I hadn't had prior before heading off to the grocery store. In my previous Steak, Potatoes, and a Green post the preparation of the steak will vary as you can see. I substituted the roasted broccoli for steamed asparagus and was planning to replace the potato starch with rice but I forgot it cook it. We didn't really need it; this steak and sauce were phenomenal and the asparagus melted in your mouth. I minced 3 garlic cloves. 1. In a large skillet melt butter. Stir in cooking oil. Trim any separable fat from steaks. Add steaks to skillet and cook over medium to medium-high heat for 10 to 12 minutes or to desired doneness, turning once. Transfer to a serving platter, reserving drippings in skillet. Keep steaks warm. 2. Stir mushrooms, green onions, rosemary, garlic, and pepper into reserved drippings. Cook and stir over medium-high heat for 3 or 4 minutes or until mushrooms are tender. Reduce heat. 3. Carefully stir in sherry, wine, or broth. Cook and stir about 1 minute more or until heated through. Spoon over steaks. If desired, garnish with fresh rosemary sprigs. Makes 4 servings. For the asparagus: Prepare asparagus by snapping off the tough ends. To do this lightly grasp each end of the asparagus and bend until it snaps. The good/tender end will be the tip and the other end can be thrown away. Fill a pot complete with steamer basket with water until it reaches the bottom of the basket. Once the water is boiling place in the asparagus. If the asparagus is small and tender steam for 3-4 minutes. Add an extra minute or two if it is larger. Promptly remove the asparagus from the steamer basket and place on a plate for dressing; drizzle with extra-virgin olive oil and season with salt and pepper. For the southern potluck, I finally decided to put my pie-making skills to the test after getting some instruction from my mom in the fall. I made Mom's pie crust, and filled it with this recipe from Paula Deen. The pie turned out great! Thanks to Granny for the pecans. Preheat the oven to 375 degrees F. In a medium bowl, stir together the sugar and melted butter. Add the corn syrup, eggs, pecans, and bourbon, and stir until all ingredients are combined. Pour mixture into an unbaked pie shell, and place on a heavy-duty cookie sheet. (Some comments said the pie didn't set in the allotted time, so I warmed the filling in the microwave to give it a head start before pouring. Didn't have any issues.) Bake for 10 minutes. Lower the oven temperature to 350 degrees F, and continue to bake for an additional 25 minutes, or until pie is set. Remove from oven and cool on a wire rack. All done and perfectly set! Another Wipeout night! I hope you haven't been waiting too long for the Southern Potluck menu. Well here it is! For the Mexican Potluck we had all the dishes on a serving table and let everyone assemble their plate and sit down. Well this potluck is Southern-style and therefore we would need all access to our feast again so we put everything in the middle of our dining table! Creamed Corn, Black Eyed Peas, and Fried Fish. Potatoes and Onions: Of course fried potatoes and onions would have been the more Southern preparation of these vegetables but I decided to save us a few calories plus I knew the fish would be fried. I used very small fingerling potatoes. They called to me in the grocery store because they were miniature and super cute. Anyway peel a stripe around the potato and then cut each one in half; meanwhile slice up one onion. Then saute the onion in a pan with evoo until softened and add the potatoes. Season the potatoes and onions with salt, pepper, and parsley. I let the onions get a little to brown so watch out for those. Continue stirring over medium heat until potatoes are warm. Prepared by myself. Add 12 tsp cold cubed butter and knead to make dough. Add wet to dry ingredients. Fold in 1 c smoked cheese, garlic, chives other whatever savory ingredients you prefer. I was supposed to roll out the dough and cut them into even pieces, but I didn't. Instead, I balled them up like meatballs and formed them into biscuit rounds. Bake them at 425 for about 20 to 25 min. Prepared by Richard. Richard made us two versions of biscuits--these savory biscuits and sweet biscuits for dessert! Mac-n-Cheese: Velveeta [whole-wheat rotini and cheese] helped out a little bit here. Still yummy and still Southern. Prepared by Tim & Ryan. Creamed Corn & Black Eyed Peas: Each vegetable was cooked on the stove top. Add a little butter to the creamed corn and garlic salt to the black eyed peas. Prepared by Holly. Fried Fish: Decided to go with frying some flounder fillets. Sliced the fillet into 3-4 inch chunks. To prepare for frying: dip in beer to moisten fish then bread in a fish fry bread mixture. (We used store bought McCormick Fish Fry mixture.) Heat vegetable oil to 375F in a deep fryer and proceed to fry fish until golden brown. Keep fried fish in a 200F warm oven until ready to serve. Prepared by Patrick. Berry Biscuits: These biscuits are inspired by the amazingly delicious Bojangles BoBerry Biscuit. Fold in 5 tbsp cold cubed butter. Refer to Cheese biscuits for rolling the dough; may roll out or form into biscuit rounds. Pour the glaze over the finished berry biscuits! Pecan Pie: Here it is. The epitome of Southern desserts--pecan pie. A Southern potluck would not be complete without this... or a recipe by Paula Deen! This was prepared with homemade crust and her Bourbon Pecan Pie recipe. This will be separately posted so keep an eye out. Prepared by Patrick and Whitney. Happy Valentine's Day! Reward Yourself! Happy Valentine's Day! This time of the year is always filled with love and warmth for me thanks to wonderful friends and family and now the best boyfriend ever. Valentine's is always nice but it's almost my birthday! This is actually my January selection. Clockwise from L to R: Tiramisu Bakery Dessert Truffle, Red Velvet Cake Bakery Dessert Truffle, Passion Fruit Seasonal Truffle, and Chocolate Lava Cake Bakery Dessert Truffle. I ran across this recipe in my new issue of Better Homes & Garden magazine. It was under a quick and easy weeknight meal. It certainly lived up to that label. You can see the recipe online here or continue reading. Patrick's biggest comment was he wished the eggplant parmesan had been fried. The eggplant was a little soft after the baking. 1. Preheat oven to 400 degrees F. Lightly coat a baking sheet with nonstick cooking spray. Cut eggplant in 1/4-inch-thick slices. 2. Place marinara sauce in a shallow dish. In a second shallow dish add bread crumbs and half the cheese. Dip eggplant in marinara then crouton mixture; press to coat. Place eggplant on prepared baking sheet. Lightly coat with cooking spray. Bake 15 minutes or until breading is browned and eggplant is tender. Remove from oven. 3. On baking sheet, toast buns for 2 minutes or until lightly toasted. Meanwhile, transfer remaining marinara to small microwave-safe bowl; heat for 30 seconds. Place eggplant on toasted buns, top with marinara and cheese. Sprinkle with basil leaves or spread pesto on bun. Makes 4 servings. Served with a side salad topped with tomatoes, almonds, and a creamy balsamic dressing. Prior to the holiday season, it came to our attention that our biggest fan wanted to try some of our recipes, but would prefer to cook from them in print form. Rather than simply print them out, we decided it would be a great gift idea to design a recipe book incorporating all of our favorite recipes from the year. Here's what we did! 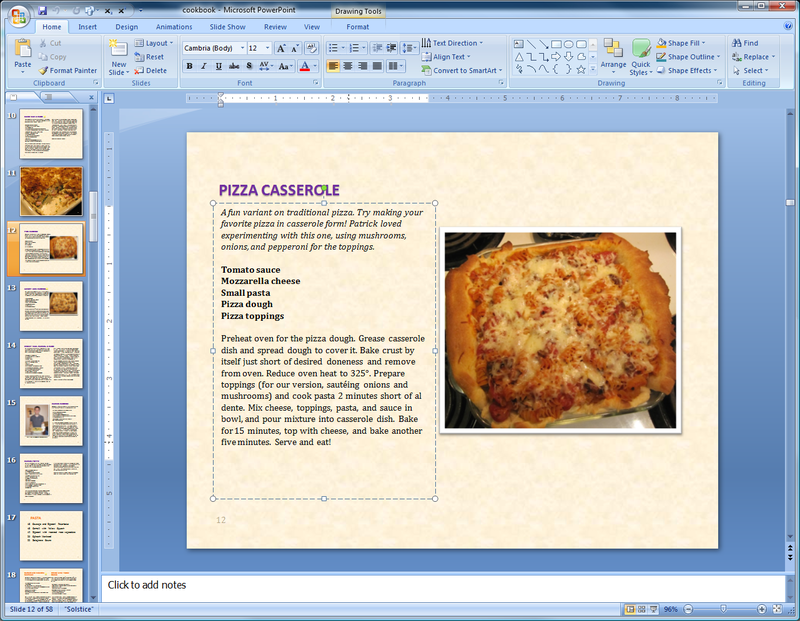 We chose to do the design in PowerPoint because it's familiar to us and easy to use for laying out pages. Starting from scratch, we had a lot of design choices to make, including page format, fonts, colors, backgrounds, and photo placement. The blog can get a bit wordy, so we had to cut down and clean up the text to fit in the allotted spaces. Based on the specifications from the publisher, we also had to set the pages to a specific size which included bleed and margins. We found Viovio to have an easy publishing process and reasonable prices. We exported the pages from PowerPoint as 300 dpi (dots per inch) png (an image format) files, zipped them into one big file, and uploaded them. The website then holds your hand through the rest of the process as you choose your book type (size, hard vs. soft cover, paper type) and cover design, and shows a nice preview of the completed book. We ordered 9"x7" softcover books, and they arrived exactly as we had designed them. It took a lot of time between us to finish it, but it was a fun project and perhaps we'll make another book for 2011! It's another weekly wipeout night! This week everyone wanted to do another potluck so I suggested a themed potluck. We settled on Mexican and it was yummy! Here are all the creations everyone brought! Top row [l to r]: rice, taco salad lettuce, taco salad hamburger topping, sausage dip, mango salsa, and chips! Bottom row [l to r]: whole-wheat flour tortilla, tortilla filling, vegetarian champinones rellenos, and avocado fries! Whoa I thought we decided on potluck not a feast! Potluck items will now be discussed in order of appearance on the buffet line. Mexican Rice: Can't have a Mexican feast without rice. Prepared by Holly. Burritos: Yummy burritos. For the filling saute onions, then add a can each of (drained and rinsed) black beans, corn, and diced tomatoes. Warm everything and serve. Prepared by myself. Taco Salad: This left an impression on Patrick the last time he cooked this. You can see the recipe at this taco salad post. He made a few alterations this time including substituting bell peppers for celery. Prepared by Patrick. Chips & Dips: The chips had two fabulous dip options to choose from. A prepared Mango & Lime dip from Honey Baked Ham. And then the classic yummy sausage dip consisting of cream cheese (2 blocks), rotel dip (1 can), and sausage (Neese's hot). Prepared by Tim & Ryan. Vegetarian Champinones Rellenos: The experiment of the evening! Straight from the chef: "I used white mushrooms for the caps. I cooked the stuffing in a pan while I simultaneously pre-cooked the mushroom caps. Stuffed the mushrooms, topped with leftover manchego cheese, then returned them to the oven." Prepared by Richard. Avocado Fries: How to make avocados unhealthy but still delicious! Peel, pit, and slice the avocados. Bread the avocados by dipping in flour, beaten egg with a splash of water, and panko bread crumbs. Fry in canola oil for a few minutes on each side until browned. Keep fried fries warm in a 200F oven until ready to serve. Prepared by myself; inspired by Christine who sent me this fabulous link for the recipe! Dips, vegetarian champinones rellenos, and avocado fries. Look at the greens in our feast! Romaine lettuce for the salad and sliced avocados for the fries. I love meatloaf. Mom might tell you something to the contrary because I think I groaned a little each time she put it on the table. Then I grew up and realized how tasty it was! Particularly the sauce that Mom always puts on it! Meatloaf without this sauce is just a little bland in my opinion. The meatloaf recipe is from Good Housekeeping but the sauce comes from the family. In the past I've made the meatloaf with the leanest ground beef but this time I decided to try (duh!) meatloaf mix! Very, very tasty. Further substitutions include: for milk - cottage cheese, sour cream, or beer; for bread - rice or macaroni. Preheat oven to 350. In large bowl mix well all ingredients. Put in greased casserole dish. Mound meatloaf and create a little crater for the sauce. Mix together sauce ingredients and adjust ingredients and seasonings to taste. Place in the center of the meatloaf crater. Bake 1 &1/2 hrs or until not pink in middle. Let stand at room temp for 5 min before serving. This week I served the meatloaf with sauteed green beans and rosemary mushrooms. For the mushrooms: heat evoo in a medium pan, add rosemary and garlic and let infuse the oil for a minute or two. Add the mushrooms and salt and pepper to taste then saute for around 10 minutes or until soft. It's the perfect time for sweet stuff! Valentine's Day is just around the corner and this just might be the thing you need to make for your honey or just yourself! However my memories of this homemade chocolate sauce come from delicious family dinners at Granny's house. No matter what dessert she fixed she always seemed to have this homemade chocolate sauce on hand. I have found that this chocolate sauce is perfect for making hot fudge brownies! Top a brownie with chocolate, ice cream, and if you're feeling extra sweet whipped cream! And remember our fabulous Lasagna meal last month when Christine came home? Well here's the fabulous dessert. The syrup is good for everyday desserts and special desserts. Melt butter in saucepan; add sugar, flour, and cocoa. Bring to a boil, continue stirring. Remove from heat. Stir in carnation milk. Return to neat boil. Remove from heat and add 1 tsp vanilla. --The first time I made this there was a trial and error period. I made this last month for our Lasagna Meal and didn't have any trouble. --It stores easily in a container in the refrigerator. For the Lasagna meal I had it a day ahead and warmed it up in the microwave to serve that evening.